One of my favorite ways to save money and time is to take overnight train rides. I can get a good nights sleep on the train, often for less than the cost of a hotel room (or at least avoiding the cost of also paying for a hotel room), and arrive refreshed and ready to sightsee. I arranged my train travel in just this way to arrive in Kollam on the south west coast of India in time for lunch, some travel plan organization and a restful afternoon at the guest house. I love this guesthouse. It is located on the shoreline, so instead of the normal busy sounds of India I can enjoy the surf crashing on the rocks. The constant sea breeze is a refreshing change to the heat and humidity of everywhere else I have been to. There is a shaded sitting area with tables and chairs, and it is the perfect spot to relax, write, read a book, and eat lovely things. 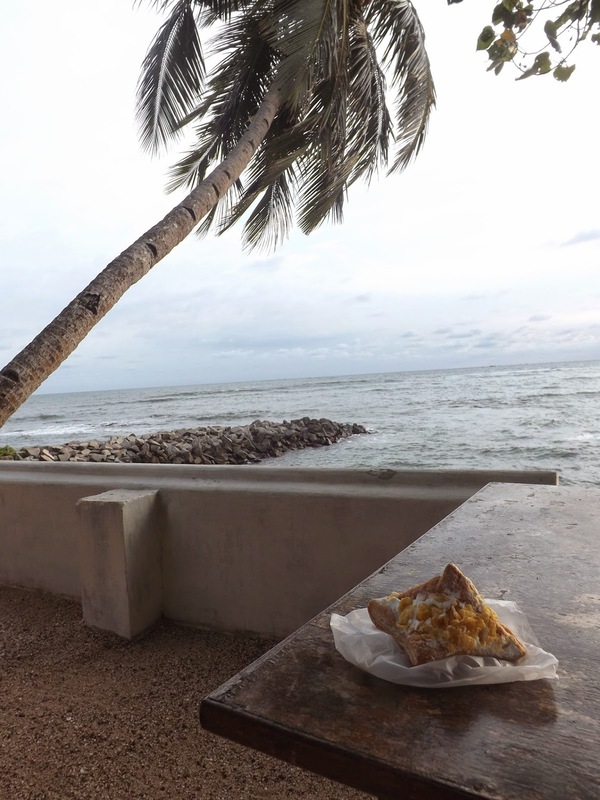 I discovered a little bakery that sells Indian-style cakes and other baked desserts, including a wonderful banana-infused-cream covered croissant decorated with corn flakes, and brought some back to the guesthouse to enjoy al fresco. Today I learned more about bananas. 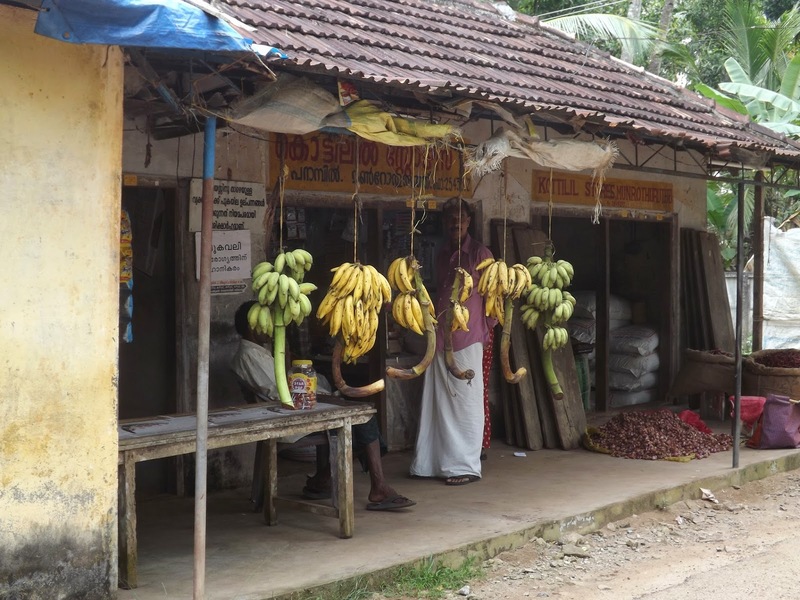 All through south India I have been enjoying the abundance of fresh bananas. The street vendors hang clumps still attached to the stalk, and cut off however many you want. There are yellow bananas of many kinds, green bananas, red bananas, mini bananas... but my favorite kind is now the fried banana. Wow. Apart from bananas and other tropical fruit, this area is a big producer of spices such as chilies, cardamom, and cinnamon. 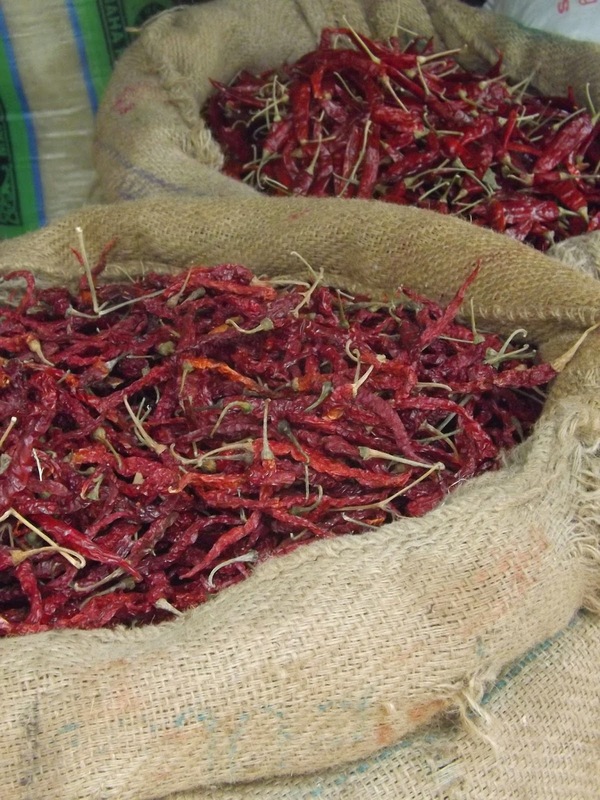 I heard that there are some interesting spice markets to visit, but not in little Kollam… but here you can find street vendors with bags of dried local spices. 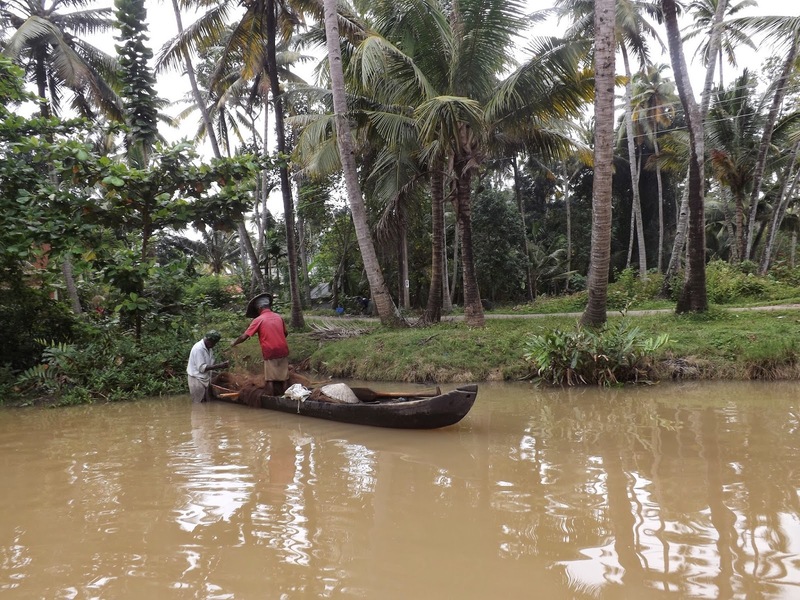 The state of Kerala is best known among tourists for its “backwaters,” the system of canals and natural waterways that link together the villages of the region. 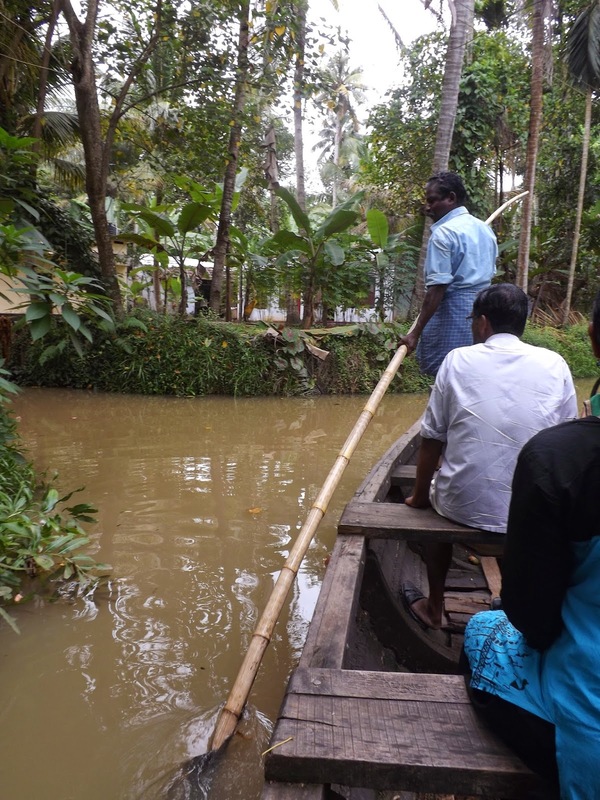 There are innumerable tour operators who offer boat trips, and Kollam has its fair share of these. 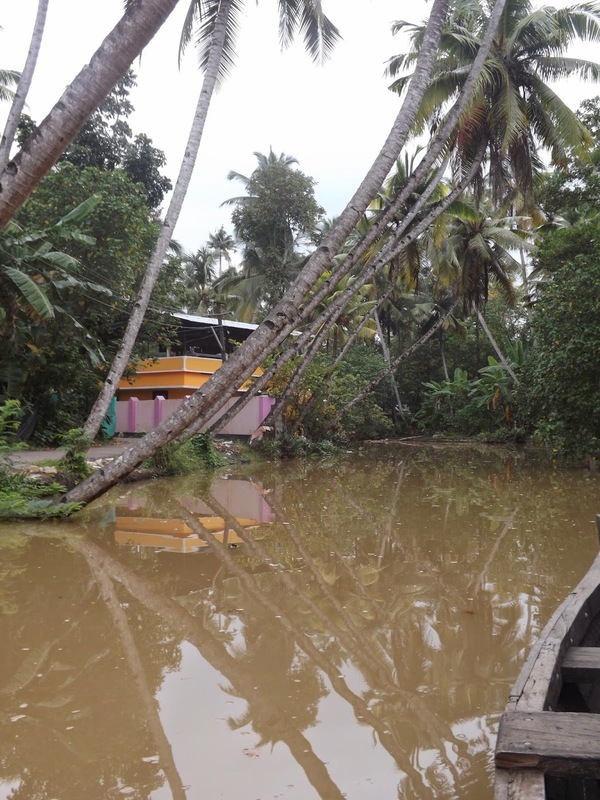 However, Kollam is not as easy to get to as some backwater launches, so it does not feel like a tourist town at all. 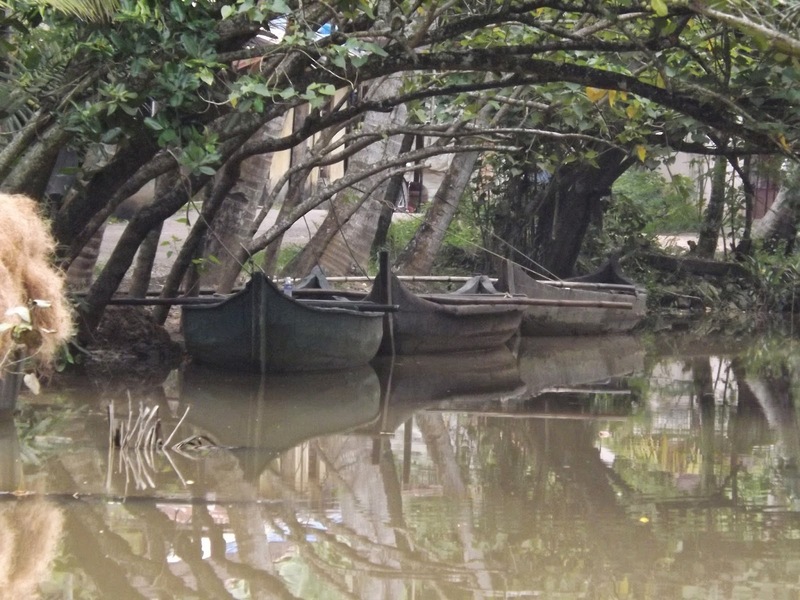 I signed up for a two hour “village” boat tour, meaning that our canoe guide took us through the narrow waterways in a rural area. It was very beautiful and peaceful to glide through the calm waters under innumerable coconut trees. Although the tour operators called it a canoe, I am not sure that this is the correct nautical term. In any case, the boat we rode in was solidly built, held 10 people comfortably, and was propelled and steered with a pole like a gondola. The waterways are the primary routes to move goods, but there are plenty of bridges for small footpaths as well. 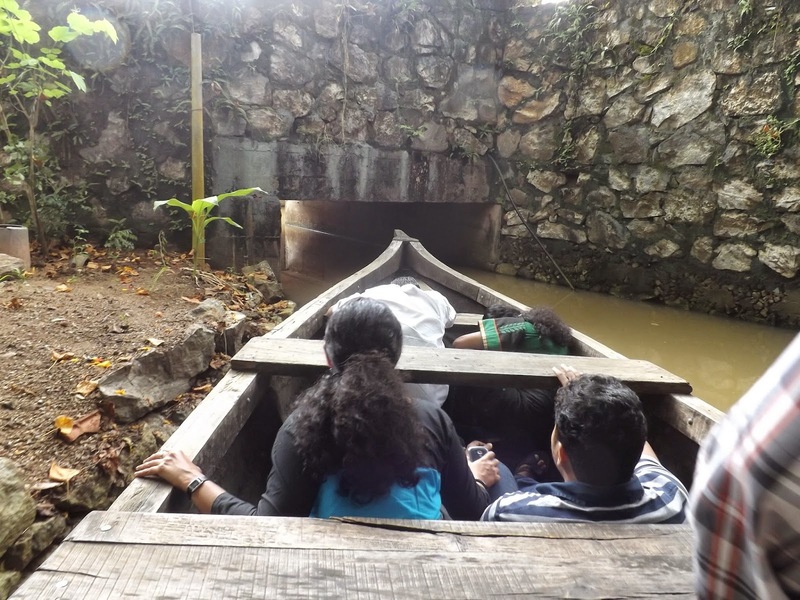 These bridges are extremely low to the water, so everyone in the boat had to duck into the boat to get through. The boat ride was an interesting way to see some agricultural activities that were not familiar to me. There were several prawn farms along the route, distinguishable from the surrounding aquaculture by their big blue nets to keep out the birds. Also, we saw coconut husk fiber being loaded into a canoe, and later being turned into rope. 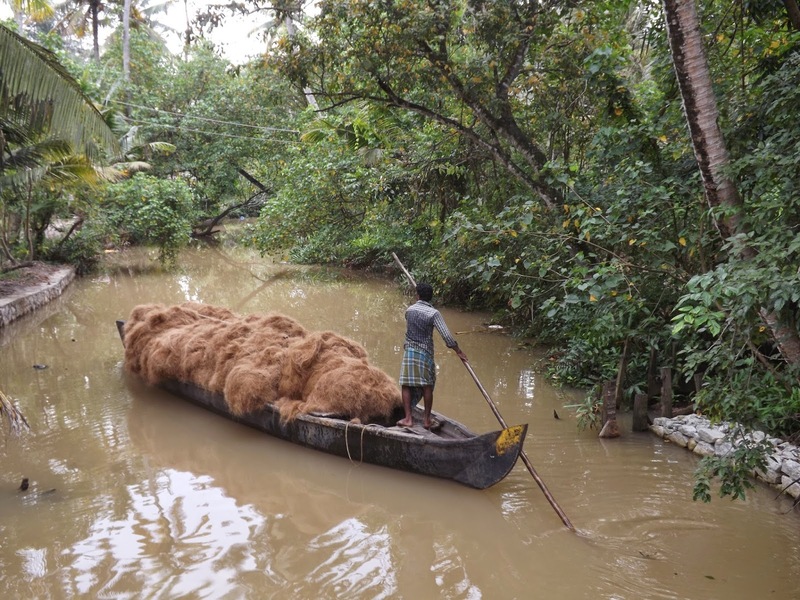 How many coconuts does it take to make enough fiber to fill that boat? 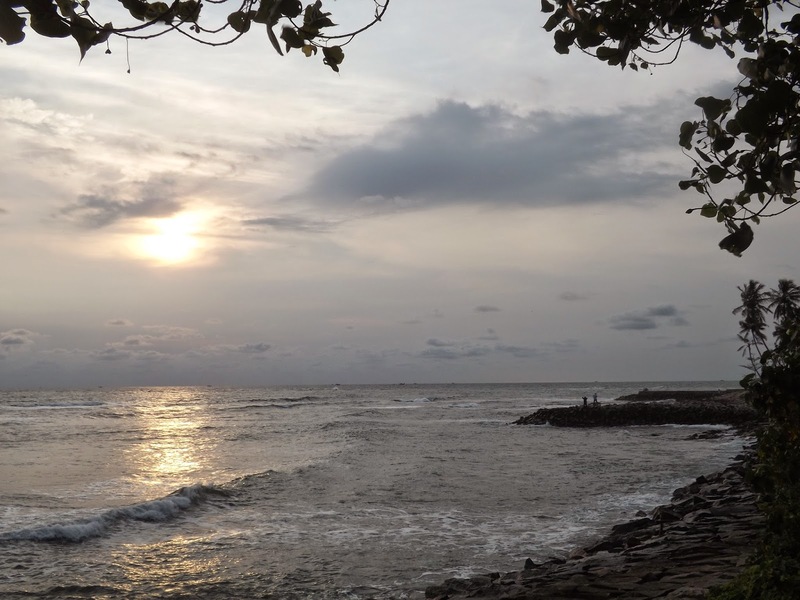 After the boat tour, there was still many hours until my next train ride, and I was content to spend them sitting outside the guesthouse again, watching the waves sparkle in the afternoon sun. It was a shame to have to leave such a tranquil place! That beach picture looks heavenly! 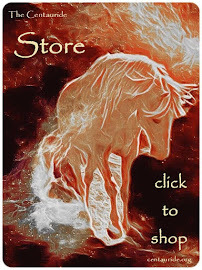 Thanks for the tidbit, Ramya! I had no idea that any English words came from Tamil roots!